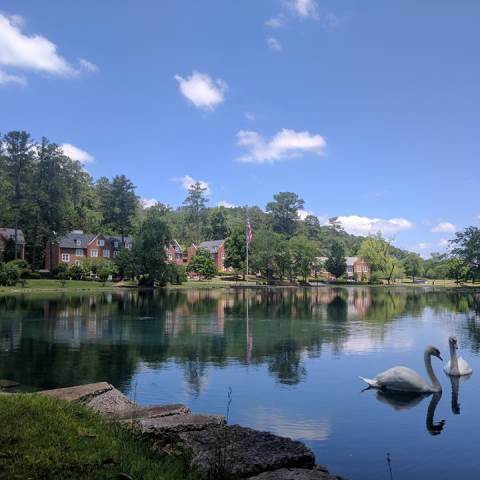 Picturesque Silver Lake is home to two beautiful swans and cherished annual events like Light the Lake and an annual Physics Boat Race. When the weather is nice, you’ll find students and faculty walking along the path surrounding the lake or teachers meeting with their classes beside the flagpole for an outside class (and you may even see someone fishing from its banks). Silver Lake was built in 1888 out of five natural springs which fed a small tributary of Silver Creek. Used for swimming, boating, and fishing during the DeSoto Park era, when Romans flocked to the park for summer entertainment. Students, faculty, staff, parents, and special guests enjoy Light the Lake, bringing the Darlington Community together to honor and remember the lives of those affected by cancer. The Darlington Community will come together on Friday, March 29, to honor and remember the lives of those affected by cancer at the 11th annual Light the Lake, coordinated by the Upper School Community Service Leadership Team.